Dryseal is a component based glass reinforced polyester (GRP) roofing system, similar to Matrix Roofing but as opposed to installed in situ, Dryseal is supplied in kit form with pre-cured parts and is not a 'wet lay' system. The benefits of the pre-cured kit increases the speed of installation helping to reduce delays from potential adverse weather conditions. Dryseal roofing is often a preferred modern choice due to this speed of installation and it's ability to satisfy most roofing requirements including complex roofs. Dryseal can be used on a number of substrates; decking, incorporating insulation and concrete. All component parts required are pre manufactured and dependent on the scale and size of the roof. 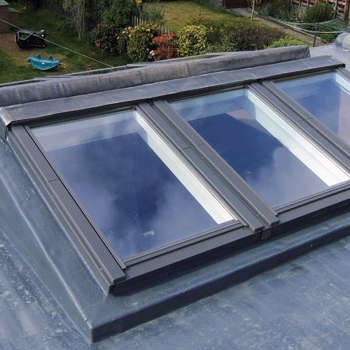 Purpose-made trims ensure the system is tailor made to your roofs requirement. Ideally suited to flat or low pitched roofing, Dryseal can be applied to other roofing projects, we recommend you call us to discuss the best solution for your roofing project. In addition, Dryseal roofing can be used in both Heritage and Commercial projects and is an ideal substitute for lead detailing. Call Bondright's helpful and experienced team today on (01491) 579659 for your free quotation and advice on your Dryseal roof.